During my travels in 2008 I spent three months inside one of the axis of evil: Iran. I met the most hospitable people, experienced a fantastic culture and saw plenty of old historical sights. Not at all the impression you get from the western media and definitively not what the American government wants you to believe. While many westerners have the impression of Iran as being an Arab country filled with terrorists the fact is that Persians live there, not arabs, and terrorists attacks are unheard of. I would probably say that Iran is one of the safest countries in the world to travel. 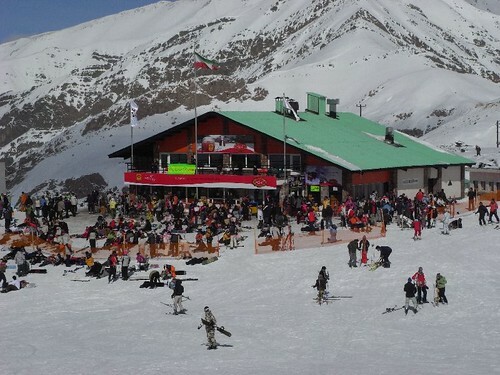 My personal highlight was the 10 days or so I spent in Dizin, a ski resort 2-3 hours north of Tehran. Most people think Iran is a desert but there are actually very high mountains several places in Iran. The highest peak Mt. Damavand at 5610m is even higher than Mont Blanc. The top of the ski resort is at 3700m and that makes it one of the 10 highest ski resorts in the world. The best thing about the place though is the amazing powder snow. And what makes it even better is that you got it all to yourself. All the Iranians just take the lift to the top and make their slow way down to the restaurant in the middle of the slope. The rest of the day is spent drinking tea and showing off their latest Burton gear. The powder is untouched for you to enjoy. Finding information about Dizin was a bit problematic before I arrived. So I came up with a solution to that problem and created a website called DizinSnowboard.com where you can find information about snowboarding and skiing in Dizin and options for accommodation, transportation and such. Please take a look and leave some feedback. Written on 02 February 2009.